Dachshunds do seem to have the reputation of being ‘lazy’. Whether or not that reputation is deserved, I’ll let you be the judge. I can only tell you what I’ve read and what I’ve experienced with my mini Dachshund, Sampson. First you must understand how the mind of a Dachshund works. 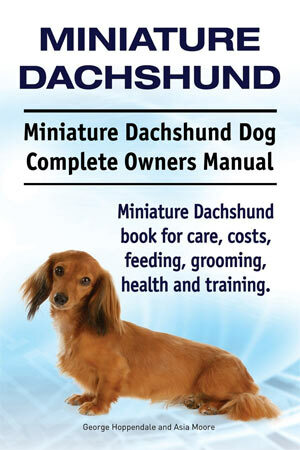 Dachshunds are very much resourceful, adventurous, playful and independent, and perhaps at times – a bit lazy. Dachshunds are very much their own dog. Not by choice really, but because of they way they bred. Remember, Dachshunds were bred to flush out and chase badgers in the forests of Germany. They had to be able to make split second decisions without having to wait for their masters to arrive and give them a command. Hmmm, so I don’t think they were bred to be lazy. 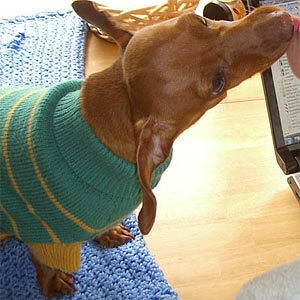 Aside from being hunters, Dachshunds are very much ‘lovers’. To put it simply, they ‘love’ to be wherever you are and put their nose in whatever you are doing. They will often follow you from room to room seeking to be right by your side. If you are working at a computer, they will more than likely want to sit on your lap. This way they can see what you are doing and assist you if needed :-). If you are sitting on the couch watching TV, they will sit on the couch with you (not on the floor at your feet). So basically, how active you are will sometimes be a determining factor in how active (or lazy) your Dachshund will be. Another big factor that will determine if your Dachshund will be lazy is his/her weight. Is your Dachshund overweight? An overweight Dachshund will definitely not want to play games or run around. A Dachshund will also wag his tail with whip like speed at the chance to play a game with you (so long as it’s on his terms). 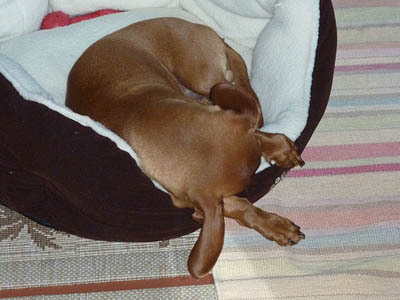 In fact, our mini Dachshund, Sampson, is often the one to initiate ‘play’. Grabbing one of his toys, whipping his tail back and forth, and running back and forth when one of us enters the room. Doesn’t sound like ‘lazy’ to me! In my opinion, the Dachshund is not an inherently lazy dog, although like most dogs, they definitely have their naps during the day. Remember, stimulate your Dachshund mentally, as well as physically. The activity will do you both good! Thank you! We have a mini long- hair who wants to get into everything, and a regular smooth coat who is slightly overweight. Both understand the word outside and race to the door.